In honor of National Bacon Day in September, this is my third bacon dish for the month <see prior Pig Candy and Breakfast Fatty>. I decided to “bacon-fy” an American classic. 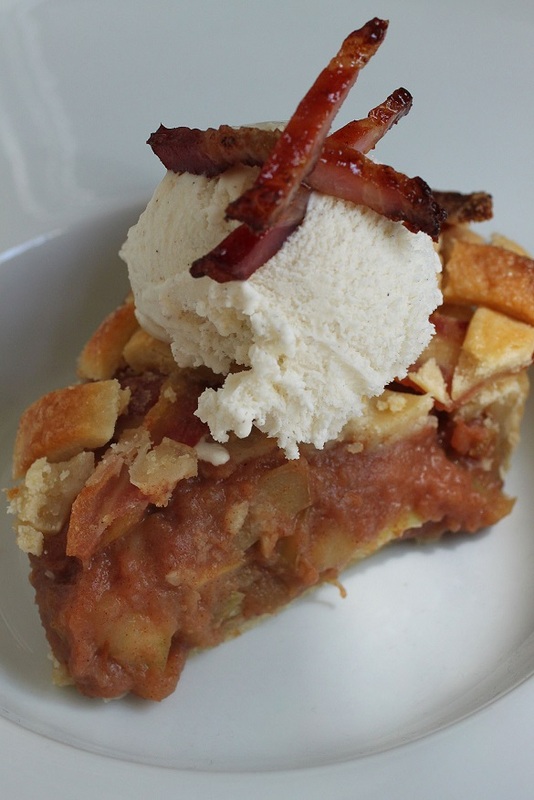 Everyone has had apple pie but not many have tried it with bacon. So, I decided to make a Bacon Apple Pie. The salt of the bacon actually works well with the sweet to create a savory flavor and texture I think you’ll like. 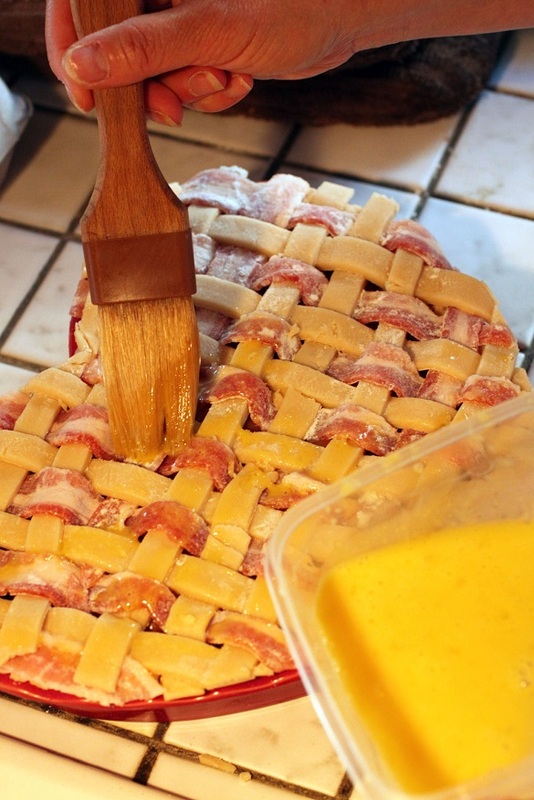 The trick is to not overdo the bacon as too much bacon will overpower the apple flavor and flaky apple crust. 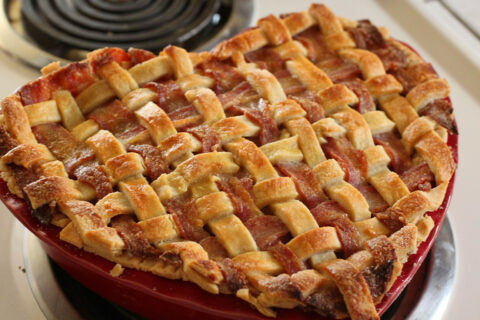 In this Slapilicious Bacon Apple Pie recipe, I only use thin half inch strips interwoven into a lattice topping with regular pastry. It’s important to bake it long enough for the bacon to crisp up but not long enough to burn the edges of your crust. Once the crust starts to brown, I suggest you cover the edges with some foil so it does not get any darker while you wait for the bacon to crisp up. Also, use thin-cut bacon as the thick-cut ones take too long to cook and your crust may be too dark by the time the thick bacon is done. I like it best served a la Mode with my favorite Ben and Jerry’s vanilla ice-cream. The crunchiness and saltiness of the bacon pairs well with the sweet filing, crunchy crust, and cold ice-cream. 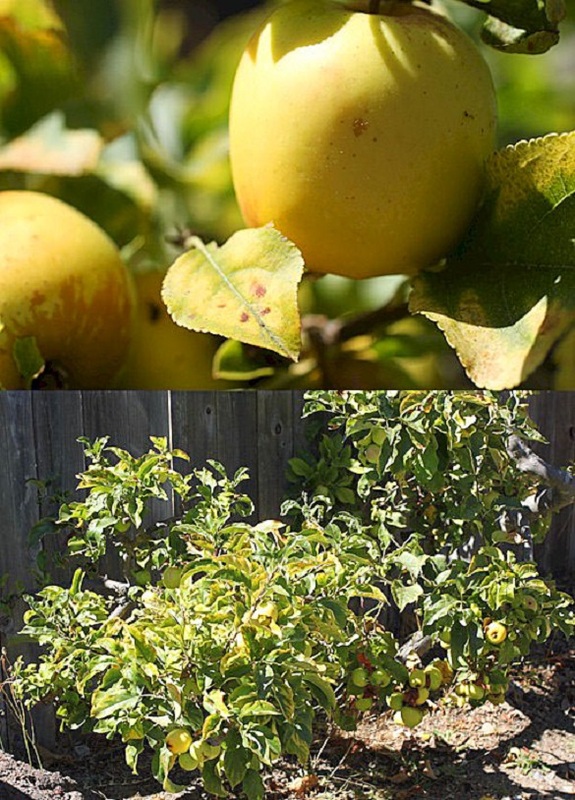 The apples I used came from a small Fuji apple tree in the backyard which, despite little care, continues to bear small but sweet apples each season. Any tart apple like Granny Smith works well also. 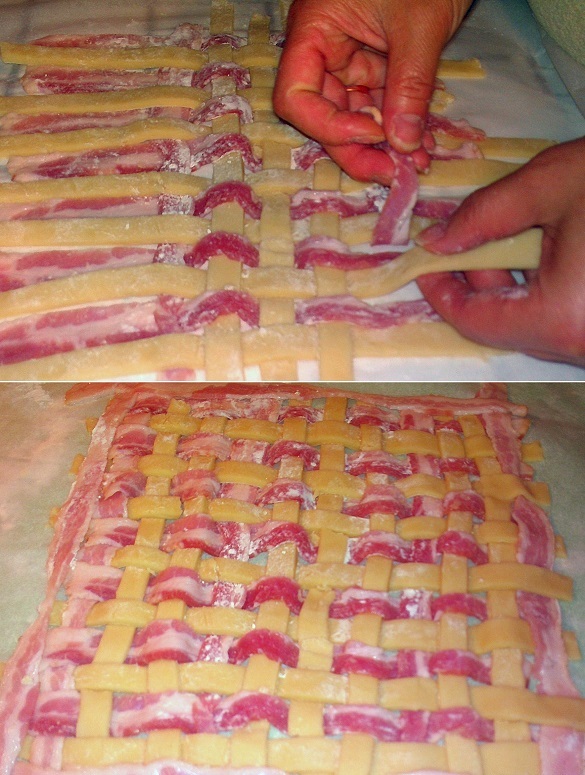 Roll out your second chilled dough and cut into half-inch strips for the lattice. Use one strip of bacon and one strip of pie pastry strip in an alternating pattern to create a 10-inch by 10-inch lattice on parchment paper. Apply a light sprinkling of SYD Hot rub that will give the lattice a slight salty note after it is cooked. Freeze lattice until hard (about 20-30min) on cookie sheet. Preheat oven to 375 degrees. Remove pie crust from fridge. 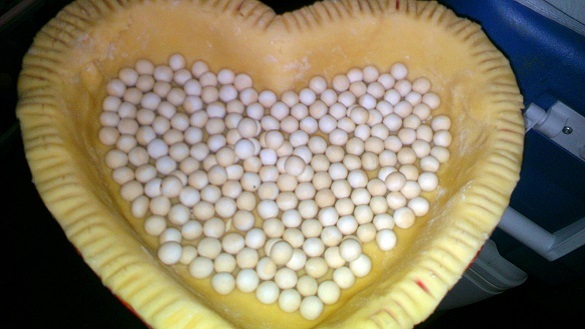 Bake pie crust with pie beads in it for 10 minutes. Bake at 375 degrees until filling is bubbly and bacon and crust is cooked, about 35 to 40 minutes. Cover the edges of your pie once it has browned. Ensure the bacon is cooked until crispy. Remove and cool on a cooling rack. Cut and serve it ala mode with your favorite ice cream and garnish with some bacon strips.